It's been lovely and warm. 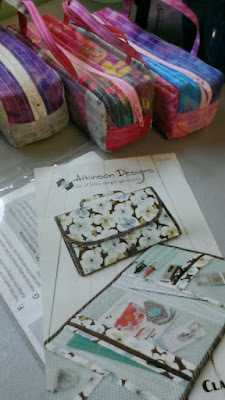 Not much sewing going on this week, but I had some batik scraps and thought I would make a few little bag kits to have ready to sew if I had a rainy morning at the cottage. And then I was browsing through my pattern stash, and thought I might finally try this pattern that I bought a few years ago but never tried. It's the Classmate pattern by Atkinson Designs... It calls for 3 fabrics. I'll paw through my stash to see what I come up with finally give it a try. Do you like making small projects. 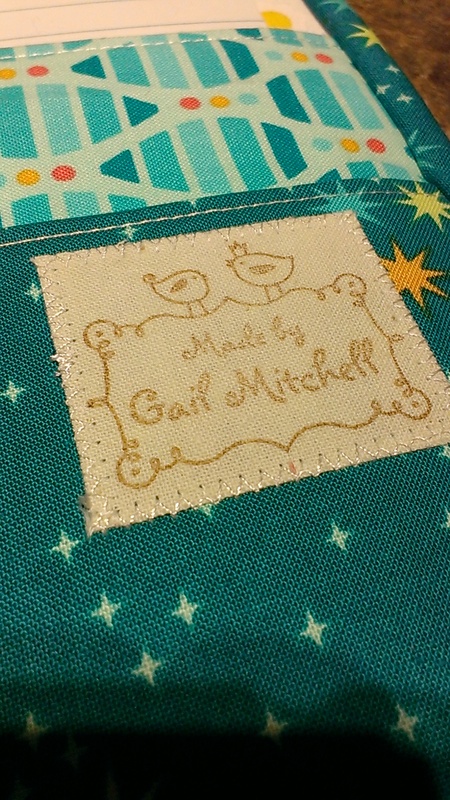 Pat from Heartfelt Quilt Shop in Winter Haven Florida knows that's me through and through. I led a few classes at her shop while in Florida this past winter and saw that some of her regular sewers like small projects too. 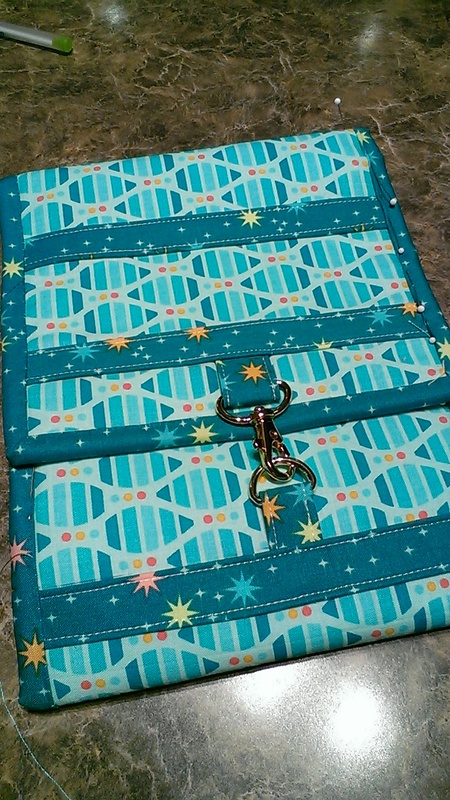 Anyway, Pat sent me home to Canada with some fabric and a pattern to try. 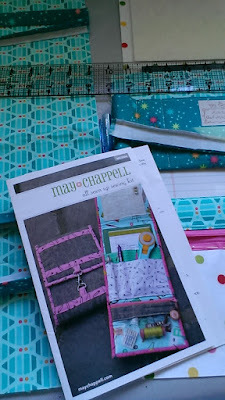 It's such a cute pattern by May Chapelle. It's called all Sewn Up... I made a prototype with 3 of my own fat quarters just to see what it would look like. It's so darn cute. Here is the finished kit. All finished. And it all closes with a trendy swivel clip... For a prototype, it came out pretty nice... 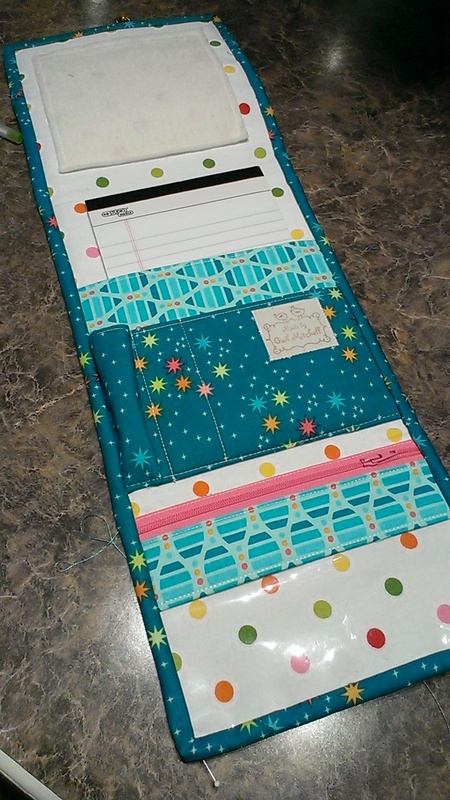 I'm glad I used cute fabric. It's a keeper. Now, I wonder if this will make a fun 1 day project class. I'll make another and see where I might make improvements and check how long it will take to make it.. I'm loving this warm weather. But it does limit my sewing. I love being outside on days like this and my sewing room is too warm to sew in. 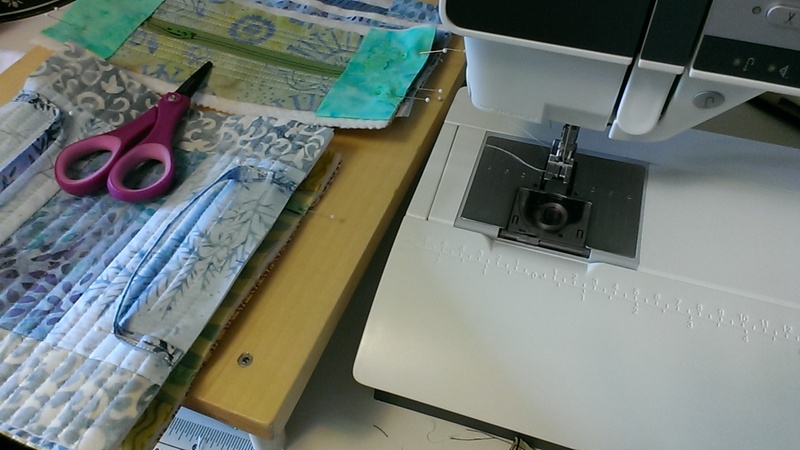 Lately I'm lucky if I get half an hour in the sewing room. One thing I try to do is to set my sewing up so that when I walk in tomorrow, I know exactly what I'm going to work on. 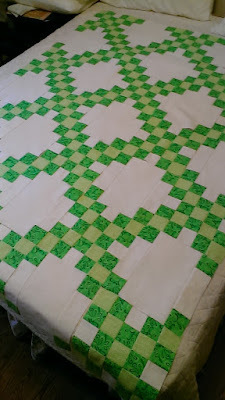 So you see from this picture, I've left the room, my machine is off, but I have work pinned, and ready to stitch when I go back in tomorrow morning. 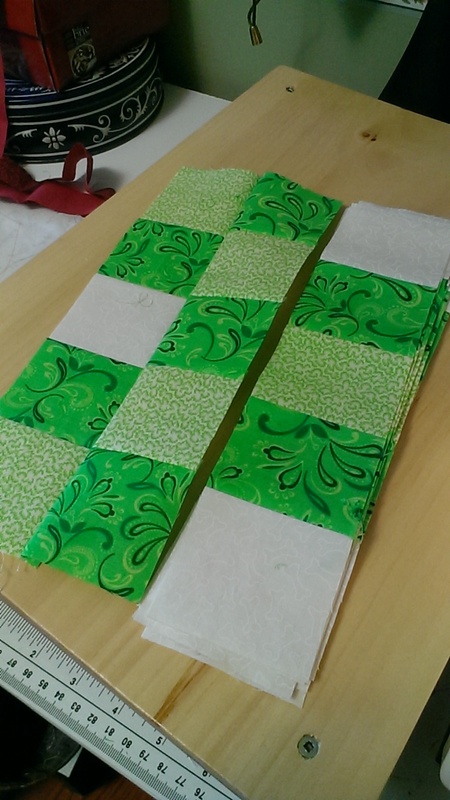 In this case, I'm working on three of the little quilted as you go bags. They are just the nicest little gifts. I've given out a few and I have none left. For example, last week, one of my quilter friends, Kaye, from way back, transported my sewing machine back from being serviced by the dealer in Moncton. I was thrilled that she did that for me. It totally saved me a 2 hour trip there and 2 hours back. When I met up with her to get my machine, I gave her one of these as bags a little thank you.... She loved it. So, it's good to have a few on hand just in case another small thank you gift is needed quickly.